There is something about the boostcontrol that`s not right. It was boosting 1.75Bar on the dyno and above that we were having typical backpressure issuses. It made 476whp and more boost just lowered the power. The timing of this engine makes it sensitive to backpressure, we would have played around with timing on the dyno but its a hassle with this engine. it appears the tuner hasn't set up the knock control properly either, I set it up in the PCL file and the LAYOUT for Shadow but the rest, required the tuner setting up correctly . I changed the cal table for the Vi-pec MAP sensor as you posted, and after that the AFR is in a different dimension. On cruising I got 10 to 12 AFR and on high load it peaks up to 18 AFR, so I only have to drive it safely for now. I didn't manage to do anything else today because I had some brake problems on the car. The bolts on the caliper broke off on the highway. Luckily I managed to pull of the highway and out of the road before the last bolt broke off and leaked brake fluid. Note to self: Don't buy cheap big brake kit for road use. I had K-sport 8 piston big brake kit. Good thing I kept the stock ones around. Is there a part number physically on the sensor and what colour is it, green or silver. Is the sensor a flat remote unit or a cylindrical unit with a 1/8 npt thread on it that is screwed directly into the inlet plenum. Did you calibrate the MAP sensor after doing the new cal for it, calibrate as in calibrate MAP SENSOR under ECU controls. I need for you to carry out the other things and have results for all of these requested tests sorry. The part number is on the plastic bag the MAP sensor was in. The MAP sensor is a cylindrical unit with 1/8 npt, and it is screwed directly into the inlet plenum. I think the color is greenish. I calibrated the MAP sensor after the changes and saved it to the ECU. There is a small note on the zip lock bag with the Volt/PSI: 0 PSI = 0.500V / 75 PSI = 4.500V. that is great news it is the MAP sensor I thought it would be. 4.500 volts = 75 psi (517.24 Kpa Gauge, 617.24 Kpa Absolute, 5.17 BAR). My brain is useless today, I put 4.95 volts. Reset these values and carry out a MAP recalibration, but this still requires other discussed issues in your P.M's I have sent you. I have edited the previous screen shot and have added a second screen shot, I have done one in Kpa and the other in PSI. I will fit a pipe to do the back pressure test, but for that I need to figure out how to get more than 14 psi of boost. OK you are using a good boost solenoid, exactly what I use, best known as a MAC VALVE. 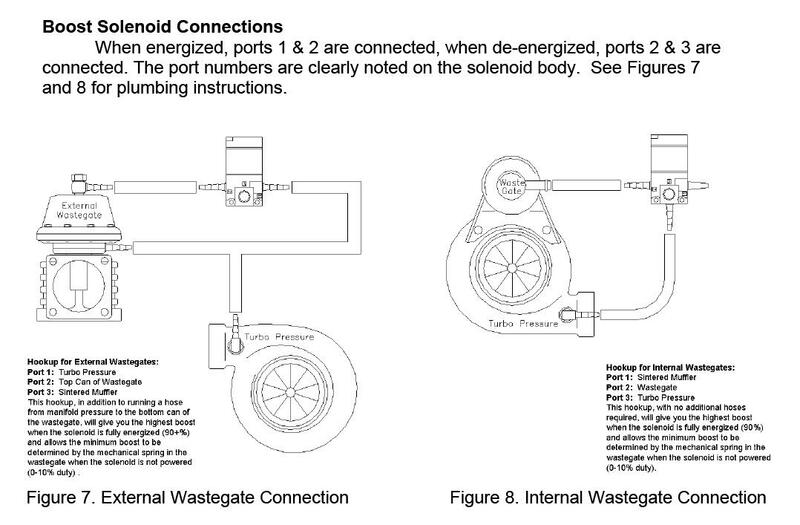 Please setup the MAC VALVE as per the attached plumbing schematic I have supplied. However BEFORE ANYTHING CAN HAPPEN, I need you to connect the hose from the compressor source directly to the wastegate and monitor when the boost begins to drop. It is very important that I know the standard wastegate spring CRACK pressure without any influences, just boost directly to the wastegate. Once this is done then hook up the wastegate solenoid. Do not worry about using the adjustable bleed valve. On the T piece ( I use brass ones) the end that is facing the boost source needs to be brazed up and drill a 0.8 to 1 mm hole in it. (the same end that the adjustable restrictor would be normally). Also check that the outlet from the compressor housing also has a restriction of equal size to it. For example a lot of compressor housing fittings are around 3.5 to 4 mm ID, this is too large and needs to be reduced back to at least 1 mm. Do not blank off ports 2 and 3. Reduce the auxillary output frequency to 20 Hz. I have started to create another PCL file for you, once I know the wastegate crack off pressure and the exhaust back pressure values. I just thought I would add an updated schematic of this drawing that I did to explain the position of the restrictors a bit better. The red is the restrictor with a 0.8 to 1mm hole drilled through it. The standard drawing also used to show an adjustable restrictor, this is not required.